Robert Surtees, creator of Jorrocks, cruelly lampooned the greatest hunting correspondent of all time, Nimrod, by labelling him Pomponious Ego. Sheer jealousy was the cause: Surtees was a brilliant novelist, but he lacked the reporting and riding ability of Nimrod, the pseudonym of Charles James Apperley (1777-1843), who magnificently conjured up the breathless excitement of riding to hounds in the Shires in vivid despatches eagerly devoured in London’s 19th-century clubland. As a belated disciple of Nimrod, I encountered a certain amount of envious comment although, unlike the great scribe, I didn’t travel to the meets with a groom, six hunters and a hack. ‘You mean, you actually visit lots of hunts, and have marvellous days on other people’s horses, without paying a cap?’ asked inquisitive ladies over a dinner table. ‘Er, well, there’s a bit more to it than that,’ I used to murmur, but, whatever I said, my friends felt the role of hunting correspondent was simply the best any devotee of the Chase could achieve. Making your passionate leisure pursuit your profession has drawbacks, but I would wholeheartedly sum up some 40 years as a Pomponious, who rode with more than 230 packs in Britain and the US, as the most wonderful privilege and pleasure. In the most intensive season, I rode 42 horses with more than 25 packs, and I am forever grateful. Extensive hunting tours will provide you with plenty of good days and plenty of less good ones. ‘Ah, you should have brought us better scent,’ one’s host would say all too often early in the season. It is vital for a hunting correspondent to enjoy hound work as much as riding, and understand that pronouncing firm judgement on the skill of huntsmen or hounds based on one visit is ridiculous standards can only be fairly judged over a long period of varying weather conditions. I hope my diary reflected these factors, although my news sense failed me once when a certain master fell from his horse through too many stirrup cups before he arrived at the meet. To enjoy being a hunting correspondent, you need a keen sense of humour, a tough constitution, a love of exploring our wonderful countryside, and a certain degree of horsemanship, because it’s a myth that you’ll always be riding one of the best horses in the field. Towards the end of the last century, experienced ‘spare hunters’ became rare, and I often managed on hirelings or young horses. Learning to smile with mild concussion is a useful attribute, especially when addressing the supporters’ club the night after. I met extraordinary, and sometimes hugely eccentric, hunting personalities. Their love for the Chase made them great naturalists, and their deep knowledge of hounds and horses was part of a long inheritance. ‘Master’, the 10th Duke of Beaufort, Capt Ronnie Wallace at the Heythrop, Sir Newton Rycroft at the New Forest, Lord (Toby) Daresbury at the Limerick, and Thady Ryan of the Black and Tans were mountain peaks in their sport. 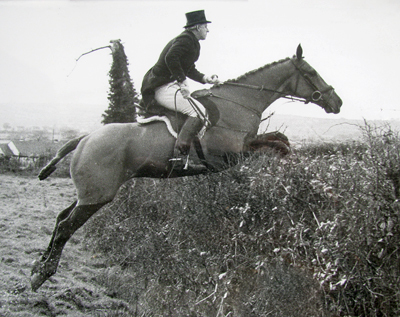 My love of foxhunting was ignited in the Portman country as a Pony Club member when Sir Peter Farquhar was master. He welcomed my unclipped, grass-fed pony at hill meets, showed me his hounds at the kennels, and encouraged me to keep hunting. I began reporting hunts in the 1960s for The Field when it was a weekly magazine. My real job was as a BBC television and radio correspondent, often in war zones; in the autumn of 1970, the editor of The Field had to advise his readers that his hunting correspondent was unable to start reporting the new season because he was still trapped in a hotel under gunfire in Amman. Three years later, I gave up 25 years of reporting mostly bad news to be editor of Horse & Hound. It was regarded as a bizarre decision by BBC colleagues, but proved to be the happiest career move. My publisher expressed the hope that I would ‘only hunt on Sundays’. I advised him gently that hounds did not go out on the Sabbath in Britain, only in Ireland, but assured him I would ‘fit in’ hunting as part of the editorship, a promise that involved years of overnight drives back to London. Using my horse’s name as a pseudonym, I launched Foxford’s Hunting Diary as a weekly feature. I could not have been more fortunate in my timing. The 1970s was a wonderful decade for foxhunting, worthy of past glories: the political threat was negligible; much encouraged by Ronnie Wallace, there was a surge of newly appointed young masters who hunted hounds; and the best hunting terrain had so far escaped the worst onslaughts of development. Then, we regularly jumped in and out across the A46 in the Quorn country to reach wonderful old turf and fences each side; now, it’s a four-lane highway bearing heavy traffic. My own Foxford was a rangy, dark bay gelding I bought in the Whaddon Chase country, where I was fortunate to subscribe when Dorian Williams reigned. Brave but reckless, Foxford never refused, although sometimes I wished he had done so. He was not quite the ideal hunting correspondent’s mount because field masters are not well pleased when the visiting scribe hurtles beside him over the first fence. This was conveyed to me in booming tones by Master, when he was at the head of the Beaufort field. ‘Stand still!’ bellowed the Duke, when Foxford was in mid-air. By some incredible feat, I managed to bring my headstrong steed to a halt, barely a stride after landing. Master, glaring through his spectacles like Lord Scamperdale in Soapy Sponge, was not impressed, and roared: ‘One more step, and you go home.’ Fortunately, I didn’t have to report the rest of the day by telephone, and, as usual, Master was a benevolent host that evening. Writing up the hunt is the only form of sports reporting in which the journalist is on the rigorous field of play, taking the same risks as everyone else-on a strange horse in an unfamiliar country. Using an old hunting saddle, with no kneepads, and badly lacking a double bridle, riding a strong puller was ‘the image of war with 25% of the danger’, as Surtees described the hunting field. I would suspect looming disaster whenever a host apologised: ‘’Fraid you won’t find much to jump here, nothing like Leicestershire.’ This meant there was a special obstacle, such as a trappy scoop in front of timber or hairy hedge, which the locals managed with practised ease, but could bring down a visiting Pomponious. I caused great satisfaction in an East Anglian harrier country with ‘nothing to jump’ when my horse dived to the bottom of one their cavernous ditches. In the Zetland country, I leapt, huntsman-style, from the saddle of my first horse to the second, which promptly bucked me off. Much rejoicing all round! Although they wished me to survive the day, hunting hosts were not averse to seeing my coat daubed with the evidence of a fall. ‘Couldn’t ride our country’ was the proud verdict after those Pomponious visits. I wore a black cutaway coat with a top hat for years, but I endured much flak from the Hon Urky Newton, the redoubtable Shires matriarch, in the late 1980s, when I switched to the new insulated caps with chinstraps that we were recommending to readers as a proven way of reducing head injuries.